The West Midlands Specialist Domestic Abuse Consortium are all specialist Violence against Women and Children (VAWC) organisations consisting of four core partners Birmingham and Solihull Women’s Aid, Coventry Haven, Sandwell Women’s Aid and the Haven Wolverhampton. They work collaboratively together on fundraising, campaigning, lobbying and seek to improve and expand services for women and children affected by domestic violence and abuse across the West Midlands. They are all highly experienced in delivered FM/HBV support to victims and have the multi-agency partnership links to ensure victims are provided with a range of services to support them. This includes excellent local and regional links with Police, Children’s & Adults Services, Housing, Law Centres, Courts, and other voluntary and statutory sector bodies. In 2015, 551 forced marriage and honour based violence cases went through specialist domestic violence agencies in the consortium. Partners in the consortium offer confidential help, advice and support. If you, or anyone you know, is in fear of a forced marriage please get in touch – Birmingham and Solihull Women’s Aid 0808 800 0028; Coventry Haven 02476 444077; Sandwell Women’s Aid 0121 552 6448; The Haven Wolverhampton 0800 0194 40. The Our Girl campaign will be disseminated throughout the region ensuring large scale awareness raising and impact. The consortium believe that the Our Girl campaign will inevitably lead to more victims and/or concerned individuals coming forward for support. The regional campaign will deliver a consistent message and a coordinated response working with schools, community groups, youth networks and frontline professionals training alongside a media and communications campaign plus the dissemination of the Our Girl DVD and materials. 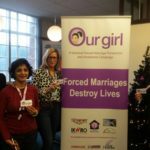 From April to June 110 professionals in Walsall, Sandwell and Dudley from statutory, health and education sectors have accessed Our Girl forced marriage and HBA training. Black Country Women’s Aid – Working with Sikh helpline to promote our girl campaign and to strengthen referral pathways where cases of FM and HBA have been disclosed in Sandwell, Dudley and Walsall. We are also working closely with Tipton Muslim Women’s Centre to develop drop in sessions and raise awareness of DA, FM and HBA. On Thursday 2nd February 4 copies of the DVD were given to people who attended our modern slavery external training. They were represented from Probation services, the hope family centre and health services. On Thursday 9th February 2 copies of the DVD were given to people who attended our understanding controlling and coercive behaviour external training. They were represented from Wolverhampton schools and health services. On Thursday 9th March 5 copies of the DVD were given to people who attended our understanding controlling and coercive behaviour external training. They were represented from Wolverhampton schools, midwifes and a solicitor. Domestic Abuse Awareness training 9 professionals from schools, faith groups, social care and probation. Age range 20 to 55 years. All female. Understanding coercive controlling behaviour training 6 professionals from schools, GP, strengthening family hubs, probation. Age range 20 to 55 years. 5 female 1 male. Understanding coercive controlling behaviour training 11 people attended. Age range from 20 to 40 years. 10 female 1 male. Weekly Groups through Coventry Haven – These are held each Wednesday to offer support in an activity based peer group meeting. Space is available to meet and gain knowledge, advice, support, 1-1 support if preferred. Subjects covered include all abuse including FM HBV but offer a more holistic style approach to create trust, friendships and an opportunity to disclose. Wednesfield High School Teenage Domestic Abuse Assembly 120 DB year 10. Age range 15 to 16 years. 70 female 60 male. In April, May and June 462 students at Highfields have watched the DVD (years 9 and 10). The impact has been an increase in knowledge on the subject area of Forced Marriage. The majority of the students had never heard of it before and certainly didn’t think it was an issue in the UK. Coventry Haven -Coventry City Centre Members of the public who attended Coventry Pride. Coventry Haven had a stall at the Coventry Pride Event in June to raise awareness about FM&HBV. 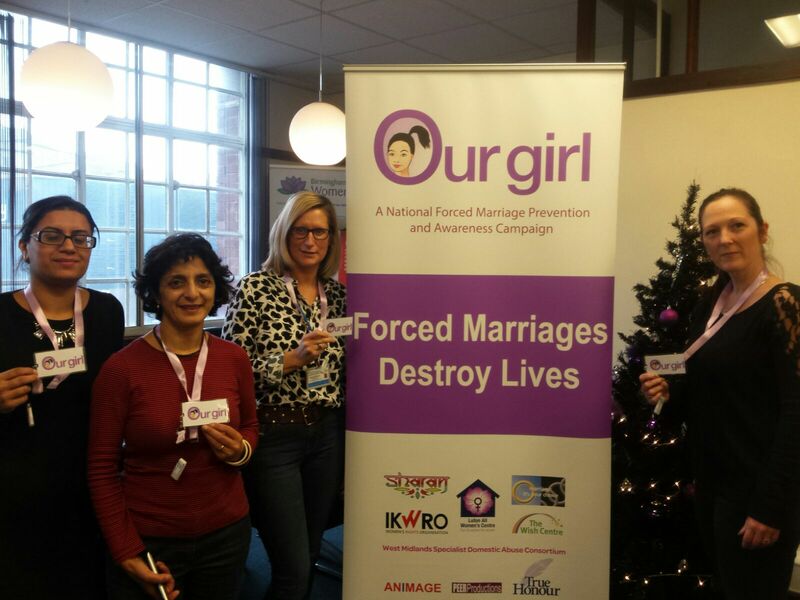 In total over 250 people had contact with our staff and Forced Marriage champions on the day. New contacts were made and discussions around developing future partnership working to highlight risks of FM&HBV for LGBT communities and individuals. Wolverhampton: to coincide with the conference, we promoted the campaign and to coincide with international women’s day, we promoted on Facebook which has 2,527 followers and on Twitter which has 4,313 followers. Black Country Women’s Aid – Working to develop “drop in” sessions at Tipton Muslim Women’s Centre, Arranging to deliver FM and HBA at Sikh youth camps in July/August. Black Country Women’s Aid – Working in partnership Gudwaras to deliver FM and HBA at Sikh youth camps in Walsall and Sandwell. Working with Yemeni community association to deliver awareness and drop in sessions.Strengthening positive working relationship with faith based organisations.